Begin with a heart shaped container and florist’s foam, then fill the heart with the universal language of love – flowers! Flowers touch our souls and brighten our spirits which is why they have remained a popular choice for ‘lovebirds’ all over the world! Depending on your mood and the flowers you pick, you can make this arrangement whimsical or elegant, so gather what you need and lets get started! Line heart shaped basket with heavy plastic. 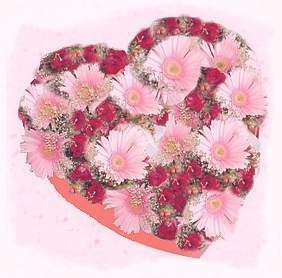 Cut a piece of florist foam in the shape of a heart – foam should fill up entire basket. Soak foam in water and place it in the basket. Cut center flowers (carnations or roses) the same depth as the basket or slightly longer. Stick these flowers into the foam in the shape of a heart – fill with enough flowers that almost no foam is showing. Create this centerpiece for yourself or make one for someone you care about. It will be sure to bring a smile to their face because they will know it was made with love!